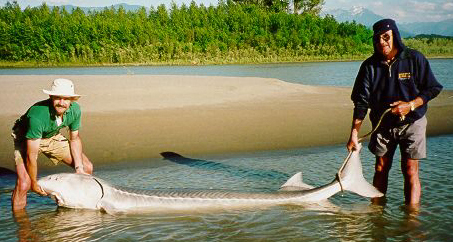 The White Sturgeon of the Fraser River in British Columbia, Canada is a very unique and prehistoric creature. Over the years, many anglers pursued these large fish. In the last few seasons however, the interest in Sturgeon fishing has definitely increased. I think that as more and more people take up fishing as a hobby or pastime, it is just a natural progression, especially when you consider that the angler days on the Fraser River have risen sharply over the past several seasons due to the popularity of the Sockeye fishery. I also feel that the increase in interest is partly a size issue. Size does matter after all, and these are the largest fish in the province. Every year a few lucky anglers will tie into a truly big fish. There are a few fish every season that will run 10 to 13 ft. in length and will weigh in at 500 to 1200 lbs. These are truly spectacular specimens, the apex of their kind. Most of the Sturgeon that are caught by sports anglers will range in size from about 3ft. to 7ft. and weigh between 20 and 250lbs. Any way you look at it, we are talking about big fish! Many people will describe the Sturgeon as ugly, I think a more suitable term would be unique. Anglers who fish for Sturgeon on a regular basis will develop a deep respect for these very special and ancient creatures. Sturgeon as previously mentioned are a very unique fish and can be identified in several ways. First, Sturgeon have no scales, they have a very tough skin much like a shark except smoother. Second, there retractable mouth is a dead give away. The suction ability that they have is amazing yet they can still be amazingly delicate when sampling an angler's bait. Third, just below the nose Sturgeon have four barbells or feelers that are used in conjunction with the pores on the nose to "smell" their way around. Sturgeon have very poor eyesight, so finding their food and determining where they are is all done by smelling or sensing their environment. Fourth, along their sides and back Sturgeon have bony plates called scutes. These scutes are very sharp when the Sturgeon are juveniles and gradually wear down and become dull with age. Be very care full when handling any Sturgeon, but especially fish 5ft and under, as these fish are still very sharp. This is their only defense mechanism and they can cut you up reel good. Sturgeon have a very long life span, some individuals may attain the age of 150 years or more. Because of this long life span and the harsh environment that the Sturgeon lives in, each one of these fish becomes a very unique looking individual. Young Sturgeon are very uniform looking but as the years march on, the battle scars of life add to the distinct look of each fish. Sturgeon come in all shapes and sizes, big, little, skinny or fat, you just never know what each encounter will bring. The Fraser River is a difficult place to earn a living, but the White Sturgeon is no pushover, not only has this fish survived when others have long since disappeared, the Sturgeon has thrived. Despite severe over fishing in the late 1800s and virtually no protection whatsoever until recently the White Sturgeon of the Fraser River are alive and well. The future does seem optimistic. Sturgeon numbers do seem to be stable and even slowly increasing. This fishery however, is still in need of very careful management and much more is still to be learned about these modern day dinosaurs. The Fraser River Sturgeon fishery has been 100% catch and release for the past six years and because of this it has become a true big game sports fishery attracting true sportsmen (or women) who are interested in experiencing a very special angling adventure. The fight and power of a large Sturgeon is truly a humbling thing. The common misconception of many people is that Sturgeon are only bottom dwellers and they do not fight at all, and that they are brought in like a dead weight. NOT!!! If this is your impression, then you haven't been Sturgeon fishing! Sturgeon are an awesome fighting fish. If you have ever caught a salmon then all you have to do is imagine that, except bigger...much bigger. Sturgeon, to most anglers' surprise, (and extreme delight) will jump when hooked. I have seen many fish in the 200lb+ class actually clear the water completely several times. Now tell me that's not exciting! In the world of Sturgeon fishing 30, 40, 50 or even 60lbs is still just a baby; we don't measure these fish in inches, these bad boys come by the foot. The Fraser is a large river almost 1000 miles long and Sturgeon can be found through out most of it. 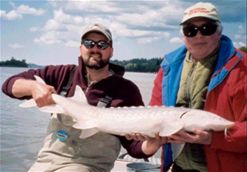 The majority of the sports fishing for Sturgeon takes place in the lower reaches of the Fraser from Hope on downstream towards the mouth of the river. While many of the Sturgeon that live in and above the Fraser canyon tend to spend most of their life in only a few spots, the fish that live in the lower reaches do move around quite a bit. 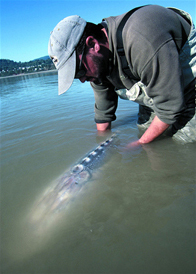 There are literally Dozens of spots to try your luck for Sturgeon in the Fraser River. During the year, as water levels rise and fall, some spots will fish well and others won't, so the angler that is willing to spend some time exploring will in the long run be more successful. The more good spots you know, means the more options that are open for you to fish. Sturgeon can be caught in a variety of different water speeds and depts. I have caught Sturgeon in water as shallow as 6ft. or in as deep as 85ft, the majority of fish seem to be taken in water from 15ft. to 40ft., it just depends on the location, conditions and time of year. Most anglers who start fishing for Sturgeon will already have some river fishing experience and this is an asset. When looking for good Sturgeon water remember that a lot of the same characteristics that apply in smaller rivers and streams, do apply to the Fraser River just on a much larger scale. Water speed is always an important consideration. In most conditions moderate-to-moderate slow water speeds are preferred, also remember to look for current seems, depressions, drop offs, trenches, side channels and holes. The Fraser River can be a little intimidating to the novice Sturgeon angler with all this big water and big fish talk, but a little perseverance and research will go a long way to experiencing this very special big game fishery that's right in our own back yard. The Basic tackle for Sturgeon fishing is not very technical but each aspect is important and serves a specific purpose. This is extreme fishing and we are dealing with very large fish at times so attention to detail is crucial. Most Sturgeon fishing is done from an anchored boat this gives the angler the opportunity to fish more spots and when necessary, to chase large fish when they run out large amounts of line. Rods used for Sturgeon fishing are obviously heavy duty but must incorporate a sensitive tip to detect the sometimes-delicate bites. Most anglers prefer rod lengths ranging from 7 to 9ft. Rods longer than 9ft. are unnecessary and lack the lifting power that is required to muscle large fish. Remember this is not finesse fishing, this is more like fish wrestling. Large capacity heavy-duty saltwater style reels will be necessary to hold the heavy braided line. 200yds. Of 80 to 130lb. braided line is needed for Fraser River Sturgeon fishing. Braided line is much better than monofilament, based on diameter it's much stronger and it has virtually no stretch. The terminal tackle is very straight forward also, a sliding weight system attached above the swivel on the main line called a slydo will allow interested fish to nibble on your bait with little resistance while allowing you to see the bite. The swivel must be a size 1/0 or 2/0 to handle the load that is exerted during a prolonged battle with a large fish. The leader should be of at least 100lb-braided line and its length should be between 36 to 48 inches. The business end should have a high quality 7/0 to 9/0 hook to assure a positive hook up. Attention to detail is crucial when dealing with large fish as the slightest defect will cause problems. Leaders, hooks and knots must be in perfect condition at all times. The tackle for Sturgeon fishing is pretty basic and so is the technique, once a suitable location has been found and the boat is securely anchored the hook is baited and the rig is cast into the river. Sturgeon fishing is a waiting game so good rod holders will make this much easier. When I am fishing for sturgeon on average I will check my hook every 10 to 15 minutes to make sure that my bait and tackle is O K. If I have not had a bite in 45 minutes I will move to a new location in search of active fish. Sturgeon can also be very delicate when sampling your bait so I recommend a patient approach when trying to set the hook. Setting the hook can defiantly take some practice so don't be alarmed if you miss the first few. The most common question asked of any successful angler is "well what did you get him on?" Baits for Sturgeon fishing will be determined by the time of year. Sturgeon will be looking for specific food items depending on the season. In the early springtime lamprey eels, ditch eels and eulachon are good. Later in the spring when the eulachon run sets in and peeks eulachon is the primary bait. Early summer its back to lamprey eels and ditch eels with a few squawfish thrown in. During August as the Sockeye run builds, Sockeye parts and Sockeye roe will fish well. The fall is a time of plenty for the Sturgeon and the food bag is on! Pink Salmon roe, Chum roe and White Spring roe are excellent sturgeon baits that will produce well into early December. In the winter months Sturgeon are very inactive due to the cold water temperatures and fishing is spotty with any bait. This is a good time to go Steelhead fishing. If the Fraser River has a trademark fish it would have to be the White Sturgeon. The funny thing is however, of the Sturgeon that are caught, many are done so by anglers who live somewhere else and have traveled to British Columbia, Canada to go on a guided trip. This to me seems strange as we have a first class big game fishery in our own back yard that many anglers are unaware of or uninterested in. 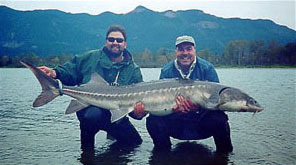 Sturgeon fishing is a unique angling experience; there are not many places where someone can basically go fishing for dinosaurs. If you like big hard fighting fish and you haven't pulled on a Sturgeon before, then you owe it to yourself to plan a trip on the Fraser River and experience all that the White Sturgeon has to offer to a true big game sportsman.